This fantastic bouquet of 36 premium long stem deep Red Roses is a wonderful expression of love. 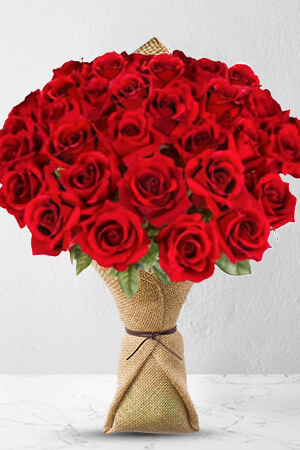 Send Roses to your loved one today.The vase in the image is not included in the price, however for a lasting impression we recommend you consider including one. There are 3 vase options to choose from; standard, premium and superior however for 36 roses, we recommend the Superior Vase. There is no extra charge to have same day delivery. Delivery rates are based on several factors such as products ordered, size of delivery and area being delivered to. You will be able to review all delivery charges on the order Review Page before completing your order. Most standard floral orders delivered to metropolitan areas have a reduced delivery charge of 14.95AUD. Deliveries are generally delivered before 5pm on your selected delivery date. You may organize delivery on most days with the exception of Sunday's and Public Holidays. To have flowers delivered on the same day, be sure to order before 12pm for Monday though Friday and before 9am on Saturdays*. When providing the delivery address, we ask for special instructions. We can either leave it by the door, on a verandah, by the garage or even with a neighbour. My wife loved the flowers. Excellent service From the reminder of our anniversary to the delivery which all went smoothly and professionally Thank you and well done! Smooth and very effective ordering, delivering and follow up process. Well done! Delivery on time, in less than 24 hours as promised; very trusty website & assistance! The flowers are beautiful and made her so happy. So far it is good however when I tracked the order it said it would be delivered yesterday Japan time, but it wasn't. I hope today they will arrive.